a marvelous FGM from the great state of NY send me two squares for my friendship-ghan!! Things, life, have been difficult for me this year. I planned on this being "my" year after 2009. Sadly, this one's not so hot either. I've had a few surgeries, several procedures, my Grandma passed away, and I haven't been feeling much like "chatting" to anyone online or even in person. I haven't been on CV since Feb.
Then, yesterday the mailman handed me a puffy envelope. I knew in my heart it was a RAOK! I just knew it was! Sure enough, Fairy Godmother's REALLY do exist and I am so grateful to mine who sent two beautiful squares to use in my friend-ghan-which btw I'm so close to finishing thanks to all those who find it in their hearts to reach out to someone like me. Thank You! Thank You for making me smile and feel loved. Thank you to 2 FGMs. One in IN and the other in MN. I received squares for my friendshipghan from each of them! Its been a long week and they were a much needed pick-me-up! I've been getting so many squares in the mail lately I was surprised today with this lovely little ! 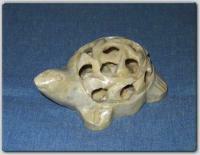 Its carved stone and being the rock head I am its double wonderful! Thank you to my FGM in NJ!!!! Thank you to my FGM in CA for the beautiful friendship square!! 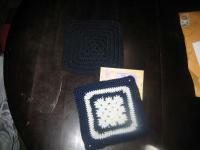 thank you to the FGM in Shelton WA who sent me 2 great looking squares for my friendship afghan. really brightened my day! 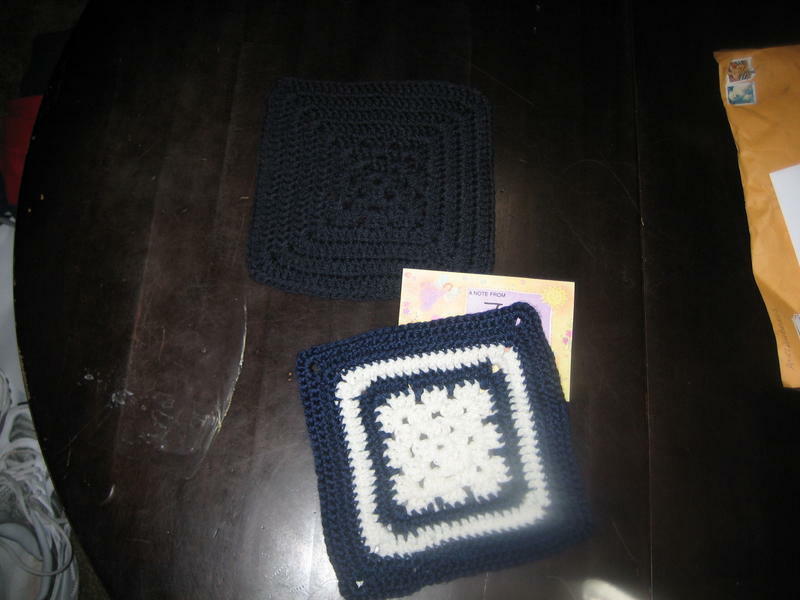 Thanks so much FGM from Missouri that sent me a very pretty square for my friendshipghan!! Thank you so much to my FGM from Illinois who sent me a skein of ILTY! Not having a Hobby Lobby, I've never tried it, and now that I've gotten my hands on a skein, I can see why everyone here raves about it. It's wonderful! A HUGE suprise today - I had a wonderful box of cupcake goodies from a lovely FAiry GM...rubber stamp cupcake-12 little cards with cupcakse, 3 packs of notecards with cupcakes, cupcake stickers, a fun cupcake bookmark,and a really adorable cupcake trinket box! Thank you to my FGM in WA for my friendshipghan square and 2 skeins of RHSS! I love them both! The yarn will make someone a beautiful bag! Thank you to my FGM in WV for my beautiful friendship square! Thank you so much to my FGM in FL that sent me 2 skeins of RHSS (they will make a pretty bag and maybe a turtle for me ) and some wonderful homemade bread! It smells delicious! And such a sweet card! Thank you to my FGM in El Paso, Tx. Mailman dropped of some beautiful bookmarks. Dont' know about anyone else, but I can never have enough. Thank you to my FGM in UT who sent me a square for my friendshipghan, 2 crocheted potholders, Gold Bond hand lotion (which I can use since its one of the few that I'm not allergic to) and the wooden ruler! It was all such a wonderful surprise!!! Yesterday my mailman put a package in my mailbox all the way from Poland. When I opened the package, I found a beautiful wooden box in the color of blue with a gold ribbon around it. 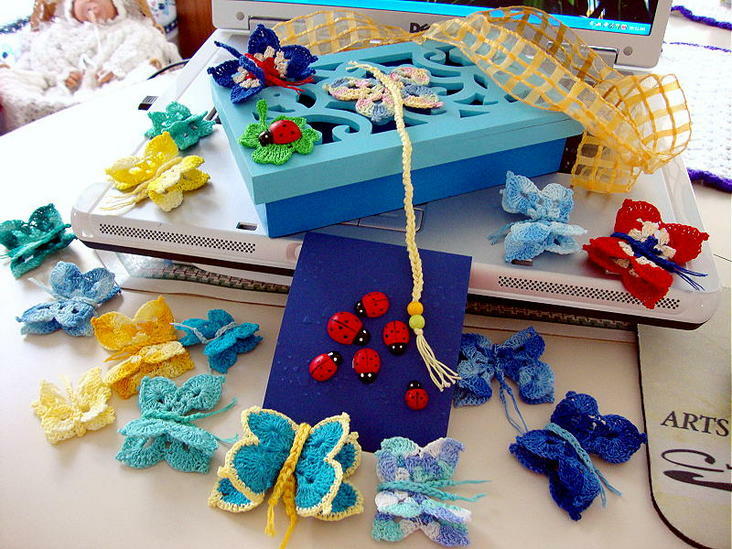 Upon opening the box, a mound of 3D butterflies and ladybugs fluttered out and landed on my table. I have been admiring these for quite a while, and now I own some. Oh they are going to look beautiful on my tree and my table. So Thank You so much FGM in Poland. Your work is exquisite. Thank you to my FGM in FL for my beautiful friendship square! It will make it special! I received 2 packages today! 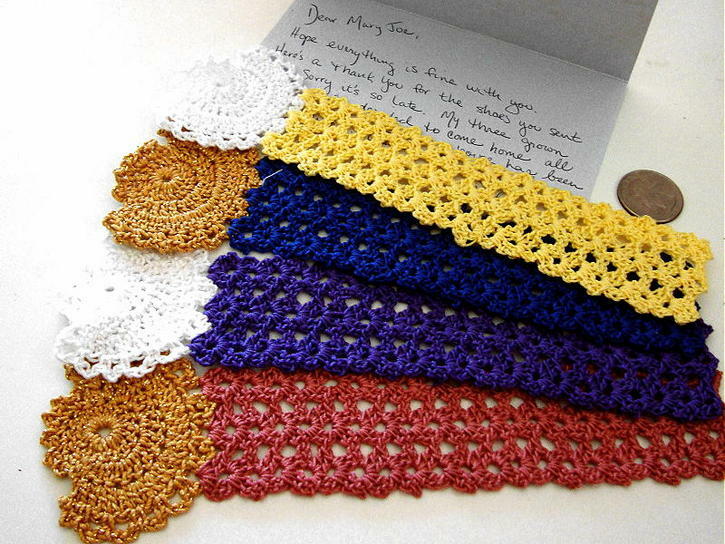 One from a FGM in MO that sent me a beautiful square for my friendshipghan (and one for my mom's comfortghan)! Thank you! The second was from a FGM in WA with 2 squares for my friendshipghan and 2 magic potholders! They are all beautiful and I love them! I've had those potholders in my WIM for forever!!!! A special thank you goes out to you today . I hope it is ok that I post it here. I have never signed up for the wish lists before, but definitely need to send a thank you your way . To anyone reading this, I got the most beautiful fairy -angel doll,done in a green dress, since it is my favorite color . She has curly hair and flowers in her hair and carries a bucket of flowers. She has fairy dust sprinkled all over her too . She even has a necklace with my name on it . She is now hanging on my front door so I can share her with everyone who comes by ! What a wonderful surprise. I thank you from the bottom of my heart . You are such an angel yourself, no wonder you are sending angels to others ! Be watching your mailbox ... I am not as talented as you, but will be sending you something in return to bring something nice to your mailbox . Thank you to my Fairy Godmother in Altoona Pa.
for all the yarn you sent me.You really made my day. In fact you have made my week!!!!! I have been wanting to make some baby cocoons for a home for unwed mothers and some hats and booties.